Another one of the things in Life that I love, is Color. I never really enjoyed anything that is a drab and not colorful. Well, while down in the State of Delaware over the 4th of July week-end I decided to go snoop around in some of the many, many stores that have sneakers for sale. I wanted something colorful that I had seen before, but were just too darn expensive for me. I happen to find out that Reebok was having a Sale on most everything in the store. Great! Let’s go take a look. After putting up with horrendous traffic and crowds of people I found these in the Reebok store. Buy 1 pair, get 1 pair free! Good enough for me. Let’s do it. Buy 1 pair at $49.95! These shoes are very comfortable to wear and I just love the colors. This is the Bridge from an Ariel view. This is not my photo. It also shows the inlet to the Indian River Bay with the Delaware State Park on the left and right. This is the Bridge all lit up at night. I was told by a fellow photographer that I should take a trip over to the Bridge and shoot it at night. I had no idea that it did this. So, I packed up my photo gear and went over here. This was the first time I tried some night shots using my Nikon D7000. It came out pretty good, despite my first try. The Red & Green lights in the center of the span show which area the boats should come in the Inlet. Green is the center of the Inlet. For this shot, it took me 4 different try’s to get it just about right. I’m told that I don’t have my settings quite right, but I’ll keep trying as time goes by. Here’s another shot of the Span. FACTS – The original name for the Indian River Bridge was the Charles W. Cullen Bridge. 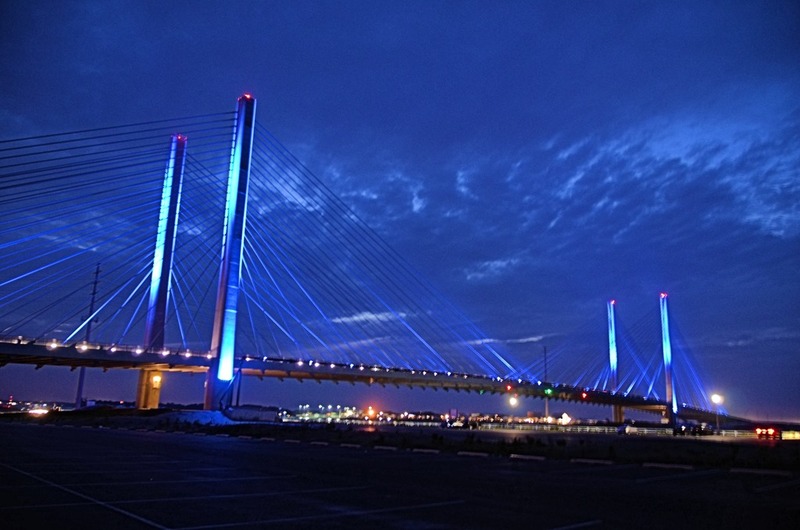 It is a Cable-Stayed Bridge and is 2600 ft. long. It is 107.66 ft. wide and has a 960 ft. Span. It has a 45 ft. over-head clearance. It was built at a cost of $120 million in 2012. There were also 4 other Bridges before this one.